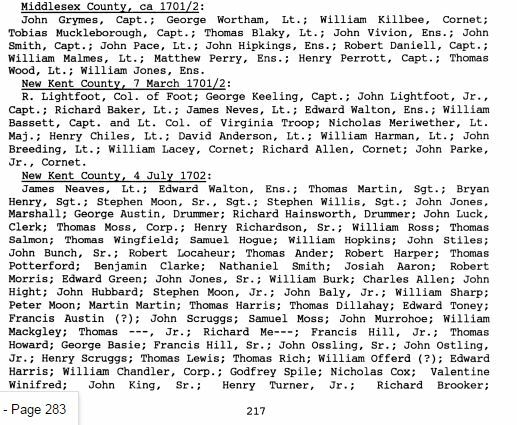 (Note: Not too far away, in Stafford County, Virginia, John Gowing, William Gowing, and James Gowing are serving in the militia in that county. (See William Gowing’s page: https://goyengoinggowengoyneandgone.com/william-gowing-born-1677/ ). There is no evidence at this point they are related to each other, but they are close to the same age, and all serving in the militia, so it is a possibility to keep open that they were related in some way – brothers/cousins possibly – at this point it is difficult to know without a Y-DNA match to someone who can definitively link their line via documentation with this particular line). 1743-1744 Michael Gowing Sr, Michael Gowing Jr., David Gowing, Edward Gowing. 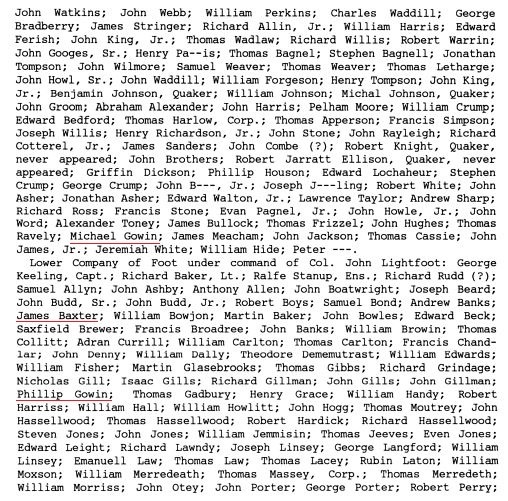 1744-1745 Michael Gowing Sr, Michael Gowing Jr., David Gowing, Edward Gowing. 1744 1745 merch acct book w Michael Gowing Jr and Sr, and David plus Edward Gowing in Hanover Co, Va.
1752 Sept 15 – David Staples grantee – Description: 400 acres begg. at a corner pine of Michael Goings thence on Orphants line; south &c. to a corner white oak on Farrars Branch. Va. Land Grant – Henrico County. http://interactive.ancestry.com/6131/VGS_1993_01_01_0146/520651922?backurl=http%3a%2f%2fsearch.ancestry.com%2fcgi-bin%2fsse.dll%3fdb%3dvgs%26gss%3dsfs28_ms_db%26new%3d1%26rank%3d1%26msT%3d1%26gsln%3dGoing%26gsln_x%3d0%26MSAV%3d1%26uidh%3dm37&ssrc=&backlabel=ReturnSearchResults&rc=229,484,371,522 1752 Michael Going living adj to Staples and Orphant in Henrico Co, Va.
John Gowen born about 1705 (? Dont see a John mentioned in any docs – I see a Michael Jr, Edward, and David – dont know where they get John here). Same as above? 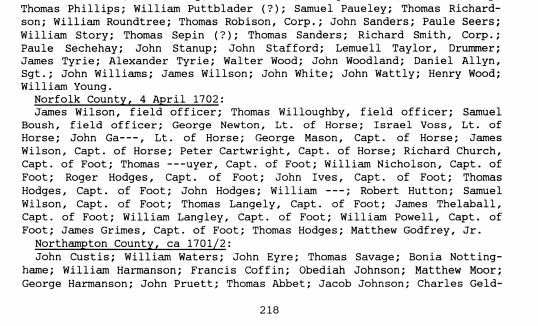 .. . .
Michael Gowen (G9/1.4), son of Christopher Gowen (G10/1.1) and Anne Gowen, was born “1st month, 1675,” probably in Gloucester County, Virginia.